Tennis elbow is the common name for pain around the lateral elbow and forearm muscles. Tennis elbow has also been called ”lateral epicondylitis”, “lateral epicondylalgia”, “wrist extensor tendinopathy”, or just “lateral elbow pain”. Tennis elbow is most common between the ages of 40 and 50 but can affect any age group. Tennis elbow is an overuse injury of the wrist extensor muscles, that is felt as pain on, or just near where the muscles anchor onto the bone on the outside of the elbow. The pain can radiate down the forearm and is aggravated by gripping and lifting. The pain usually begins gradually, following a novel activity that involves excessive load on the forearm muscles. 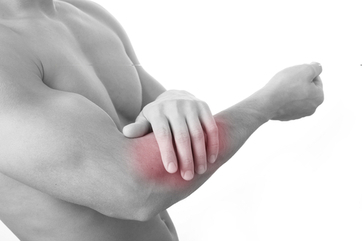 Tennis elbow pain goes through two stages. Firstly, an acute initial pain that will probably stop you doing the aggravating activity. This is usually easily managed with rest and ice. If you push-on despite the pain, tennis elbow can develop into a chronic problem that takes longer to get better. Once you’ve had the pain for a while the symptoms can vary. Some people have a pain that is annoying but doesn’t stop them doing anything, while others will struggle to pick up a coffee cup. Treatment aims to decrease the load of the aggravating activities and increase the load baring capacity of the affected muscles. Technique modification can change the angle of forces going through the sore tissues. Mechanotherapy via a strengthening program decreases pain and improves the load baring capacity of the tendons. Soft tissue techniques such as dry needling, massage, and taping can encourage healing of the damaged tissues. It is reasonable to expect a full recovery following a physiotherapy rehab program.